Just brought my '06 4 Cylinder Tiburon home yesterday. It can now join its fellow Hyundai brethren (a '16 Veloster Turbo). It has 144k on it, and some MAJOR electrical gremlins (probably due to Amateur Hour with the stereo installation). I love a challenge. It is a fun car, and will be fun to put it up against the V to see how it does, once I get it sorted. Haha, good luck with the challenge! Think I have it figured out. All the lights (turn signals, and all dash back lighting) flashes when you turn on the turn signals. The PO (Previous Owner) put in really bright white LEDs in all the corner flasher lights -which my local police so kindly reminded me that it is illegal (along with swapping the headlights out for ones with red and white LED Halos in them). Either direction both sides will flash. I disconnect the front turn signals, and that side only blinks as it should, dash lights or opposite side does not blink. So, I just need to replace the headlight housing back to stock (because it will look better) and change all the bulbs back to the factory style bulb. Should fix it. To see what it is doing search "Why do people do stupid things to cars? 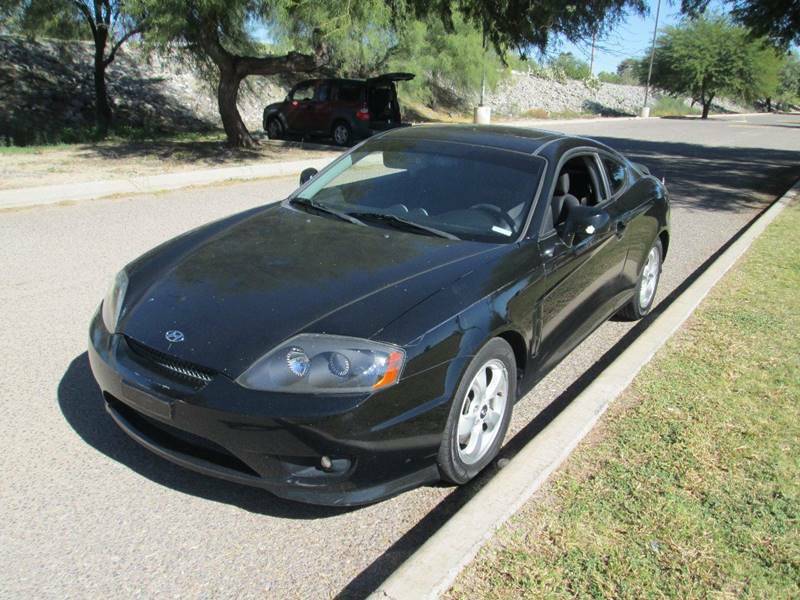 06 Tiburon" on youtube. Post count not high enough to post a link...yet. Nice ride. Be sure to take care of the usual maint items like Timing belt and water pump. The Beta 2.0 is a STOUT motor and will last a very long time when taken care of. I found a sticker in the engine compartment that says the timing belt was done 2k miles ago. Hopefully they didn't cheap out and did the water pump, etc at the same time. Edit- The interesting thing with this sticker is it says the Timing belt needs to be changed again in 60k miles. Is that true? Yes timing belts should be changed every 60k miles/100k KM. that could help me with my i4 tiburon as well. Problem is resolved. Put all factory recommended bulbs in the turn signals, and put in new non-halo head light housings (those things are pricey) to get rid of the stupid LED rings. Also got rid of the HID setup in the headlights and fog lights. All good now. Anyone interested in stupid Halo head light housings and HIDs? Side note: The LED rings in the headlights were wired into the turn signal wiring, but were not the root cause of the issue. I just didn't like the looks. And I do believe having red flashing lights in front of your car is illegal anyways. That's correct. Red lights are reserved only for the tail of the vehicle. Due 2 the fact that somebody had drilled holes for the (blue) angel eyes that were connected 2 the low beam. Which was a nice feature even after sealing it up but water continued to condensate inside. After one headlight exploded in a lil fender bender. i just replaced them with new stock oem headlights. WHich was in the $300 range. HAha im glad you were able 2 solve your issue with the headlight housings.